Matt and I met back in college in Michigan. We didn’t really talk much until when we were in Senior year. Somehow we ended up in the same senior project group and we seemed to get along pretty well. I thought Matt was a pretty jolly guy and fun to hang out with. He introduced me to caving, got me into hiking and all other things that I wouldn’t have done otherwise. Both Matt and I received our Bachelor degrees in 2003; I went straight to the working world while Matt continued to pursue his Master Degree. Eventually we got married and moved out West to Oregon and we begin our life’s journey together. Summit of Mt Hood, Oregon. 06-06-2006 – Day of the Devil or just another chance to go climbing? Aside from climbing, we do try to do some other non-climbing related activities. Especially in the winter season, we’ll often go skiing. 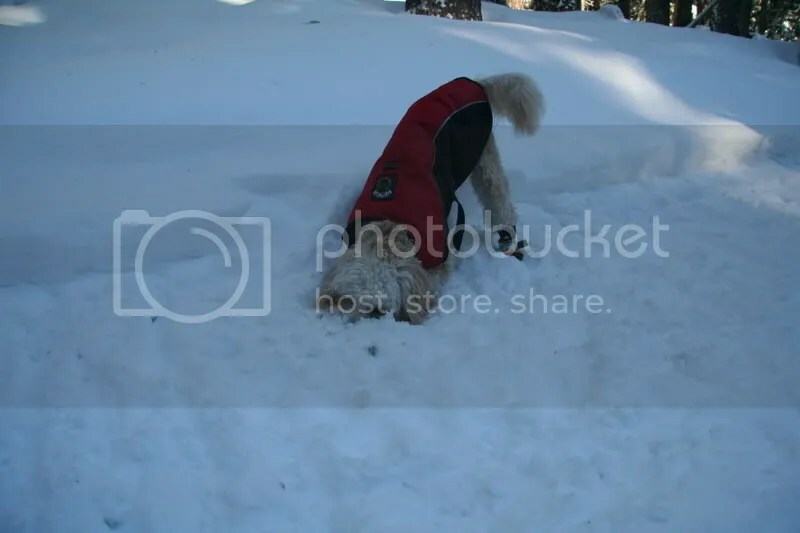 Yogi especially loves this time of the year where he gets to go off-leash in the snow parks and bury his head in snow. where in OR are you? Hillsboro, OR. 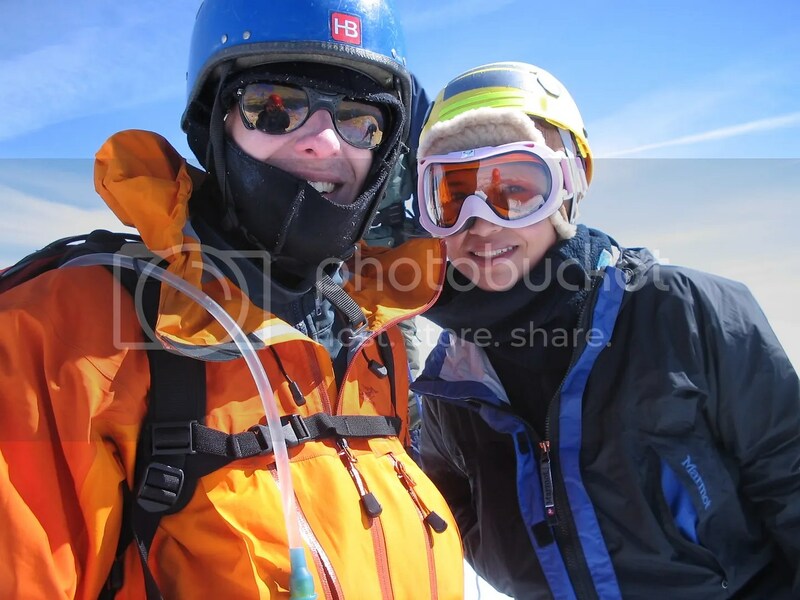 I saw that you are also from OR and climb regularly at Smith? Ya. I am in tualatin, but was in corvallis for a while. menage was our closest spot. oh how lucky. It’s almost like your climbing backyard :). I like Menagerie but I wish the rocks are cleaner and less mossy. Hey guys, shoot me an email so we can get some tentative dates for the Diamond. I’m stoked we’re going to take a crack at it. It’ll be a fun adventure. I hope you remember me. Today, I decided to check you out online. I remember you as someone who had it all – you were super intelligent, very pretty, had many guys after you and eventually had a husband. It looks like you are still someone who has it all – a husband, a nice home, money to travel, pets, etc. Anyway, you are one of the lucky ones. As for me, I do not have a romantic partner nor am I trying to get one. I am happy enough with my dog, Ara. Here is a youtube video I made of him: http://www.youtube.com/watch?v=07dcNEB97qk . I finished my undegraduate degree in Psychology Research. Now, I am doing my master’s in Applied Social Psychology at the University of Windsor. I intend in getting a Phd in the same area or in some other area in psychology. I am also a Graduate Teaching Assistant. I do not have money to travel. I used the little money I have to go to Toronto to visit my godmother and friends. Sometimes I got to Detroit for Dachshund meetups. If you are in Michigan, perhaps you can contact me and we can meet up. Anyway, this is all for now. Hi Rosina! Of course I remember you. It’s been so long since we last met, wow….anyway, I’ll catch us via email with you. Thanks for visiting our webpage. I came across your trip report on your attempt of the Dragon’s Horns on Tioman Island – I’m actually headed out there (again, after waiting a few years!) this summer and am wondering if I could pick your brains on the latest info. surrounding routes on the Horns… I’m particularly curious to know what the other project is on the Dragon’s Horns (as mentioned on your blog/post). Any information would be greatly appreciated – please feel free to contact me via e-mail. We’d be happy to tell you what we know! So the only completed route (that I know of) is still Waking Dream. The project I mentioned is being put up by one of the locals (Man, pronounced “M-ah-n”) and from what we heard, is somewhere to the right of Waking Dream. Specifically, there’s a huge angling bushy ledge that goes up and right from the start of Waking Dream. This line is supposedly somewhere off this ledge and is mostly (entirely??) bolted. They story I got was that they ran out of bolts somewhere up the face: it wasn’t clear to me if they summited or bailed from that point. It sounded like there was a plan to go back and “finish” it. I will say, though, that the local “ethics” are… well, it’s probably very tightly bolted and unlikely to follow any real natural features. I haven’t seen the route but I’m willing to bet Waking Dream is a much more “classic” line and more worth your time. If you do it, consider bringing a bolt/rivet kit: I didn’t get to see the rivet ladders but I’m guessing they’re a nightmare from the ocean air. OR if you’ve got the gear, think about putting your own line up: there’s a ton of untouched rock to the left of Waking Dream. I’d love to see another adventure route go up on that formation! Although, any routes over there would probably get a LOT of sun! I am in AR this year and I saw the both of you at the potluck at Smith 1. I went to sleep early and I didn’t get to talk to you guys. But last weekend I heard that you guys are both Michigan graduates and Engineering graduates to boot. 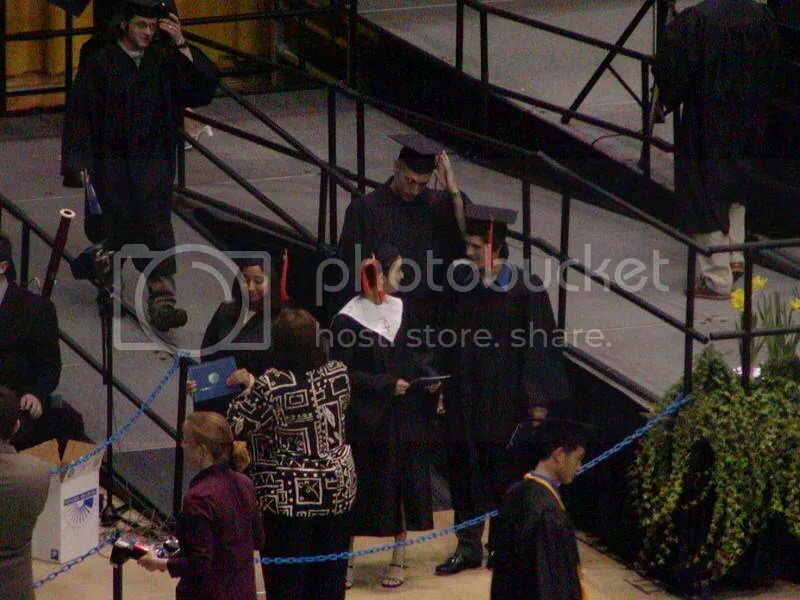 I also graduated from Michigan with BSE EE and CE in 2004. I think maybe we were even in the same classes or had similar friends? Anyway, my situation is that I am recently laid off and I have some time to kill. I am looking to take a few months (let’s say 5) to travel and climb. I don’t know what’s a good time to visit some of the places that I want to go such that I’m not cooked in 100+ sun or rained on. I want to visit JTree, Yosemite valley, Indian Creek, Squamish, Red Rocks, or other suggestions are welcome. Any help would be greatly appreciated. Maybe I’ll see you guys at Smith 2 and 3! Firstly, fantastic blog guys – great work. I have read with much fascination about your trip to Kinabalu and after having lived in Malaysia for nearly two years, figured it was well time to get over there. In fact your blog has inspired me to not only climb Mt Kinabalu but to spend some time at the Gurkha hut also. So I was wondering if I could pick your brain a little regarding the hut, permits, etc to try and avoid the farce that you guys encountered! My situation is that whilst I am a climber and would love to tackle some of the peaks on Kinabalu, I am going with my dad and whilst he is an avid trekker and is fit, he is not a climber. So I was planning on just climbing Kinabalu and then spending a few days just chilling out at Gurkha hut since it just looks fantastic and you guys have made it sound so good! I was wondering therefore how you would recommend going about getting the permit that you need to stay there. Is it just a matter of emailing them to confirm a booking? I assume it would be easier than what you were after since you were also after a climbing permit…?? Also, whats the story with guides to go to Gurkha Hut – it appears you did not use one yet all the websites etc state that you need a guide to enter the park etc, if not certainly to summit Kinabalu?? I have resigned myself to the fact that we will have to spend a night at Laban Rata which looks and sounds like a complete hole and a rip-off to boot. But if we can secure a couple of nights at Gurkha I’m sure it will be worth it. Just also to confirm with you about the facilities at the hut – you mentioned mattresses and cooking ware. I assume from that then that one doesn’t need to carry a sleeping mat etc? Also, by cooking ware, do you just mean pots and pans etc – I assume you need to take your own stove yeah? Well I would really appreciate any answers to these questions or just other general comments you may have. I have learnt loads from your blog already thanks and given there is such little info about on how to secure the hut etc, it is hugely appreciated. I look forward to hearing from you. Feel free to send me an email (@yahoo.com.au). My, oh my. I almost piss my pants just looking at some of your pictures, particularly the ones that look down showing the altitude you’ve reached.